Subdued Revenue and EBITDA in spite of festival season. There was also a high base of Bihar Elections in the last quarter. Demonetization has impacted the company adversely. Circulation Revenue rose due to higher realisation per copy. Mutual Fund income of the company is taxed at a lower rate. 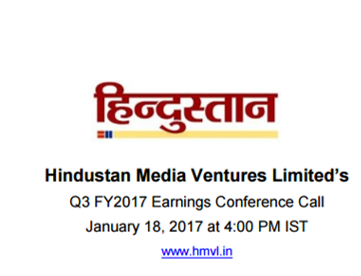 HMVL's stake is of 42% and the company has paid 75 crores for that. Valuation done by an independent valuer. Approved by Creditors, Shareholders and Court. Some of the employee cost has been transferred to HT DSL. There is a rise in other expenses due to some payments made to them. Another team will work towards monetising digital platforms in HT DSL. In this quarter there is an impact of around 11.5 crores which have been charged to the company by HT DSL. This is the impact of 3 quarters. There has been a reduction in employee cost which is transferred to HT DSL. HT DSL as per the approved merger documents charges 8% of Ad and Circulation revenue. Consolidated numbers including the revenue of the subsidiary company would be available at year end. Government Advertising is around 13-14% of total revenue share. In Q3, Government Advertising as a percentage of total advertising was higher as other categories were weak. Volume of Imported newsprint paper bought by the company has gone up due to price benefits. Currently the company is shifting to more proportion of domestic buying as the price gap has narrowed. Service charge is paid to a related party on value of imported newsprint prices. It depends on the value of imported newsprints. Impact should be visible from next financial year.